Not surprisingly, my blogging has taken a back seat to my school work over the past three days. 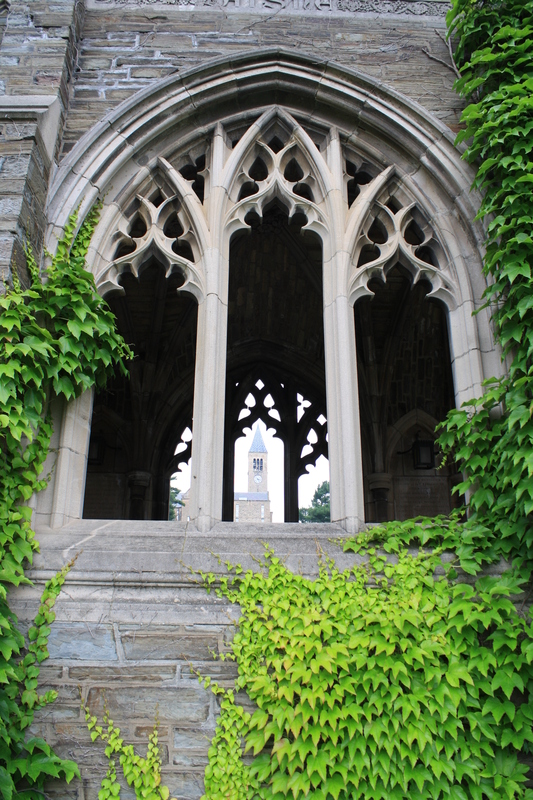 Being at Cornell – in a university setting – has been a very intense experience. Yesterday, for example, I met my group for an hour before class at 7:30 then class went until 5:00, with a one hour break for lunch. I came back to my room for an hour and got my things packed up before meeting my group again to work on our case study of the Atlantis Resort in the Bahamas. We stopped working (note the choice of words – I didn’t say finished) at eleven. Class today only goes until 3:30, then I hope to have time for one last walk on Campus to take some more photos before taking the shuttle to the airport. If all goes well, my flight will land at 11:31 p.m., and D’Arcy should be there to pick me up! As far as I know, we have two rooms booked tonight, so I’ll be back to making breakfasts tomorrow morning! The class here at Cornell has been amazing! I have met industry people from all around the world. The people in my class alone come from: Turkey, Russia, the United Arab Emirates, USA, The Philippines, China, Japan, Brazil, Australia, India, France, Switzerland, Sweden, Ghana & Germany! I will try to sum up the whole experience – maybe while flying home and have more time. Now I’m off to check out, print off my boarding pass, then go to present our case studies – it should be interesting since we have the executive director of Sales at the Atlantis Dubai in our class!! I encourage you, if you have a few minutes to click on their website to see these properties – one of their core values is to “blow people away” and I’m sure they do! **By the way, there is still time to register for the Not-Since-Moses Run which is taking place at Five Islands on the Bay of Fundy on Sunday, July 3rd!! 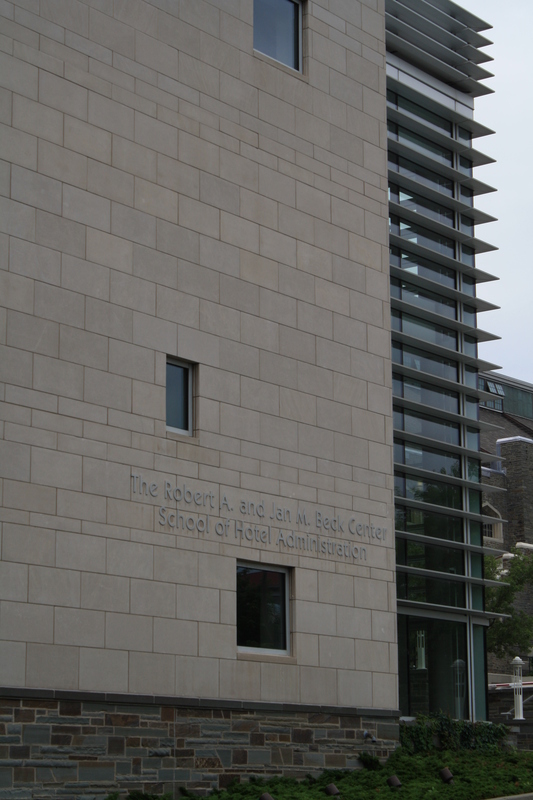 Day 3 – Goodbye & Cornell! This morning, I was finally able to sleep in a little bit longer. It was well after midnight when I went to sleep last night, so when I woke up at 5 ish (4ish Ithaca time) I forced myself to go back to sleep until a message from D’Arcy, asking a question about breakfast , woke me just before seven. The B&B was out in the country so there were many songbirgs singing & chirping and a rooster crowing. I took my time and had a shower, then we went downstairs by 8:30. 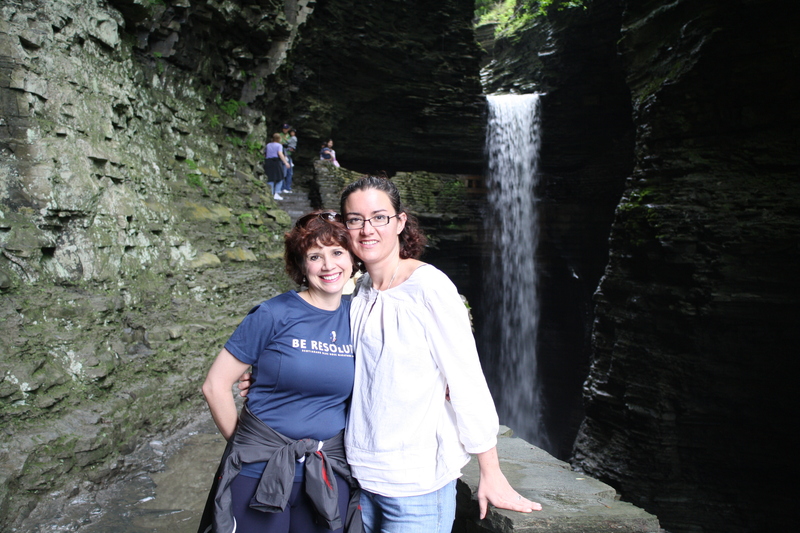 There was one other couple at the B&B who were visiting Ithaca from Philadelphia for a high-school graduation. We had a lovely breakfast of fresh fruit, juice, coffee, pancakes, local strawberries, bacon, yogurt & syrup. It was delicious! 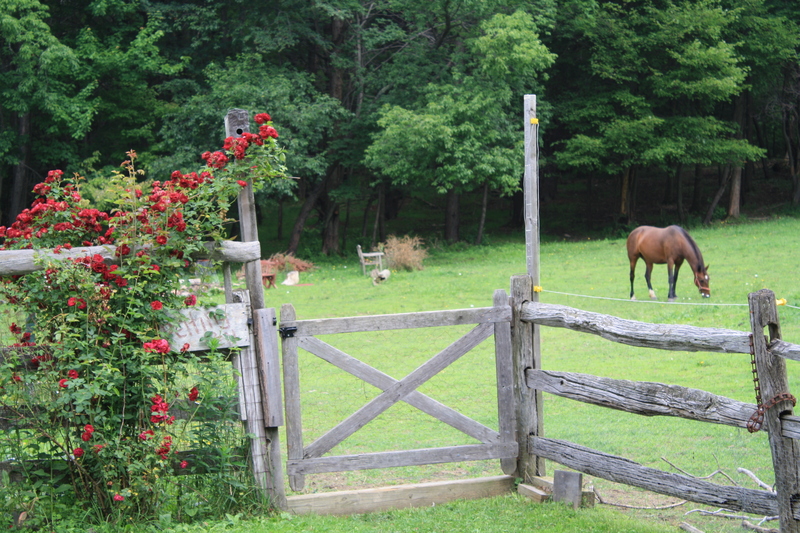 A horse at the B&B - no photo of the rooster though! After breakfast, we drove to the Six Fingers Winery. It was wonderful. I participated in both the spirit tasting and the wine tasting at ten o’clock in the morning! (It’s a good thing the “tastes” are only a 1/4 ounce!) They make their vodka from the grapes that they grow. 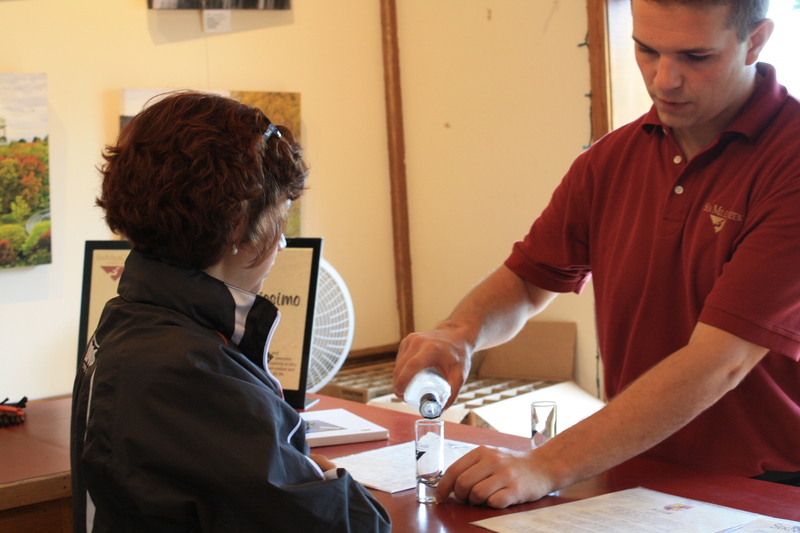 As I was tasting, I was sure to tell the General Manager about Ironworks Distillery in Lunenburg, Nova Scotia, and how they make their vodka from apples! I ended up buying a bottle of Seyval Blanc and a bottle of Grappa. I hope I am able to take them back into Canada with me. It was a beautiful setting and they had just had a wedding there the night before. We drove into the centre of Ithaca and went to Starbucks. Kate & I each had some work to do. I have to admit I had never been to a Starbucks before – there are a few in the Halifax area, but Nova Scotia is dominated by Tim Hortons. I had a vanilla latte and some vanilla scones. We worked & chatted, but unfortunately did not take any photos! We knew our time was getting short, so we spent most of our time talking. Our next stop was to fill the gas tank of the rental car: $24.90 was what it cost for us to drive around the Finger Lakes all weekend!! (It costs almost $100 to fill our mini-van at home.) Gas here is around 80 cents per litre! Wow! We returned to the Ithaca Tompkins airport to turn in the car and waited for the shuttle to take us to Cornell. It was a quick drive and Kate’s sisters were here to pick her up shortly after we’d arrived. We were in the lobby, waiting. It was hard to say goodbye, but we hope that she & her family will stop in at the Belgravia Bed & Breakfast on their way to PEI later in the summer. .. I think everyone on the East Coast is feeling the same way! The School of Hotel Administration - where my classes are held! 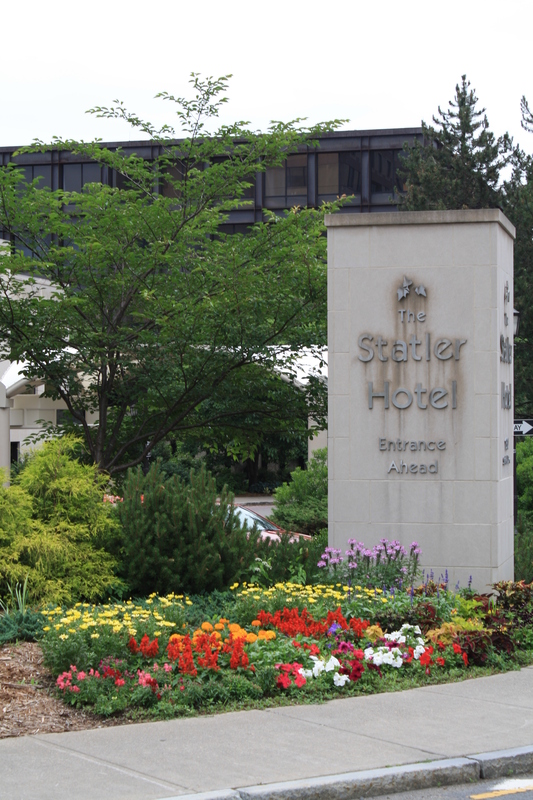 I got a sandwich (which turned out to be delicious) and came back to the Statler Hotel to do some work. I was showered and in my pj’s by 6:00. I finally talked to my family and now it’s time for bed! To see all of the photos of my trip, please click here! Tomorrow: First day of class!! 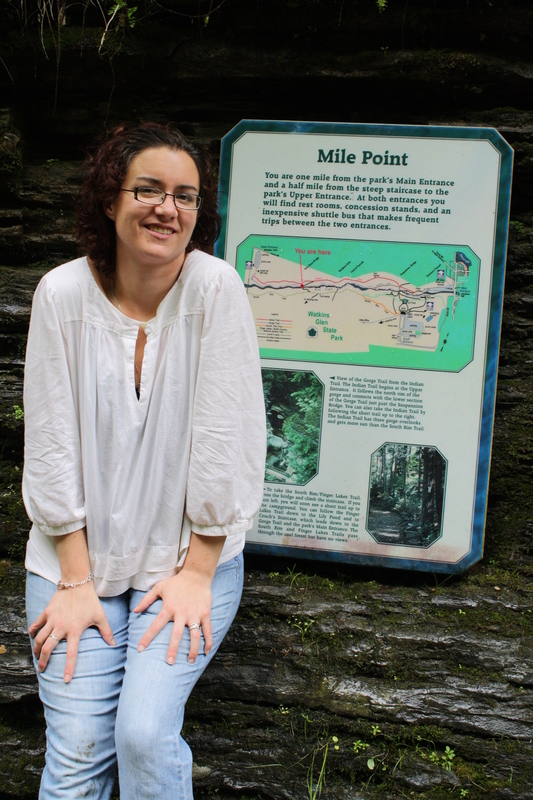 Exploring the Finger Lakes of New York – Day 2! Talk about experiential tourism!! 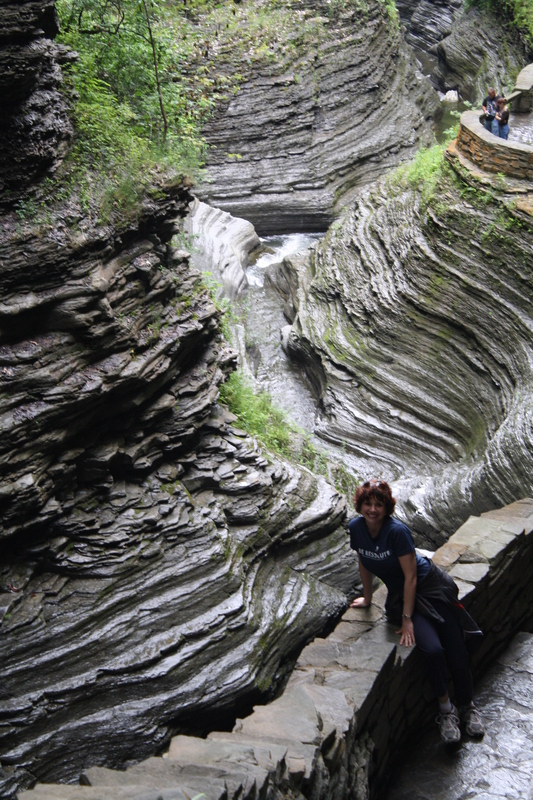 Today, we “experienced” some of the Finger Lakes region of New York State. Unfortunately, my internal clock doesn’t realize that I was “on vacation” this morning, so I was wide awake by 5:30 a.m which was 4:30 am Ithaca time! Sharing a room with Kate, I didn’t want to wake her, so I tried to go back to sleep. It was no use. I finally opened the computer around 6:00 and started to do some work until it was time to get up and ready for breakfast. Breakfast at the Thomas Farm B&B was wonderful – I’m not surprised as the owner told us they have been in business since 1988! Kate & I were the last to arrive and there were eight people already chatting over coffee when we got there. 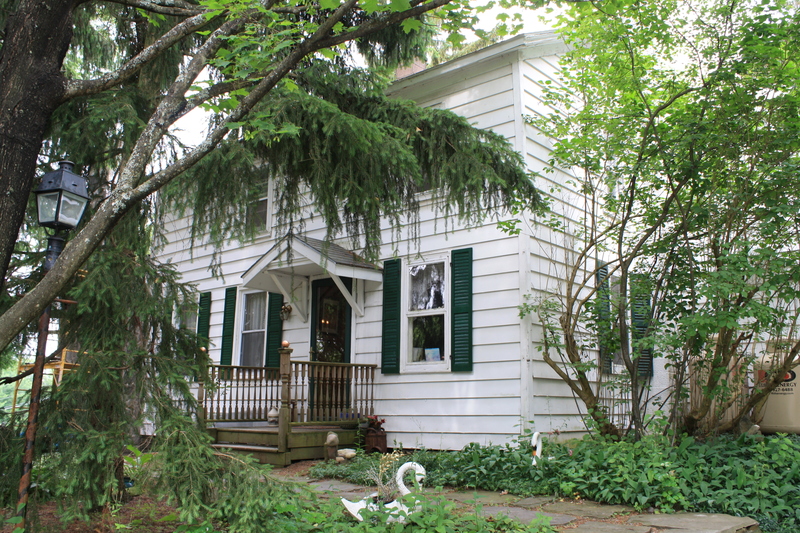 (In New York a B&B can have up to five rooms, where in Nova Scotia, a B&B is defined as “four rooms or fewer”.) There were two senior couples, a mother & her 17-year-old daughter and two women who had been roommates in College, but now have grown children. I was the only Canadian. We had breakfast of fruit, juice, sausage, French toast with strawberries & maple syrup, and lots of coffee. The conversation was animated & fun. Coincidentally, one couple is planning a trip to Nova Scotia next summer, so I gave them our business card! We’ll look forward to seeing them again when they come stay with us at the Belgravia! 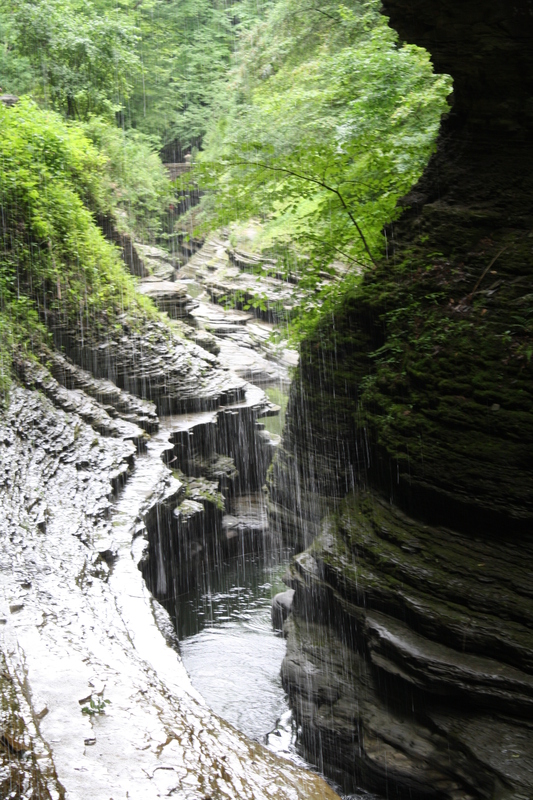 We left shortly after breakfast and headed to Watkins Glen where we hiked a mile up and then back in the Gorge. It was beautiful! The temperature was just perfect and there were no bugs. A lot of the scenery in this part of New York reminds me of the scenery you would see in parts of Central Nova Scotia or the Annapolis Valley. This Gorge, however, is unique! We giggled a bit when we noticed a large group of people looking down into the gorge, taking photos and exclaiming! 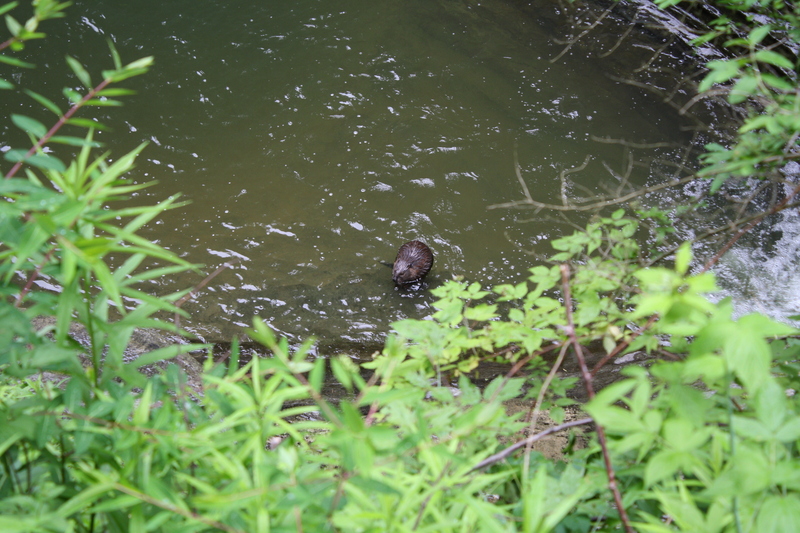 It turned out that there was a large Beaver watching everyone above. I joked to Kate that he must have been the welcoming committee for this Canadian! 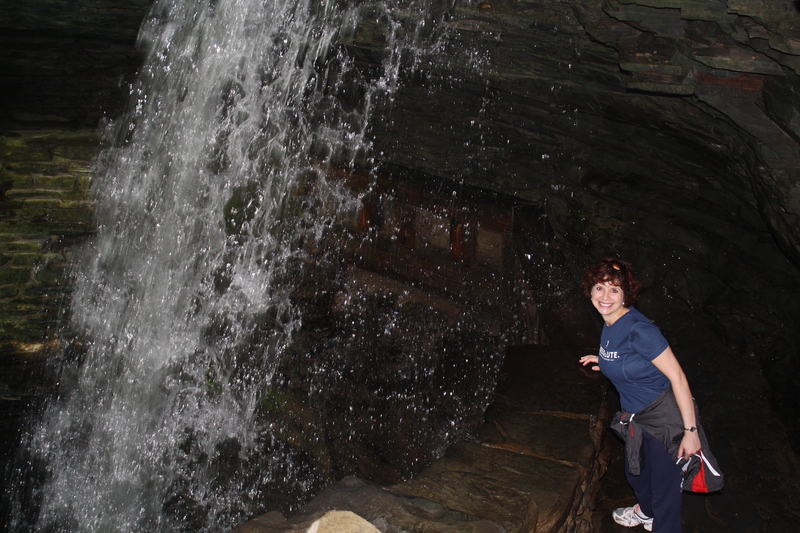 I'm behind the waterfall here! The topography was just beautiful! 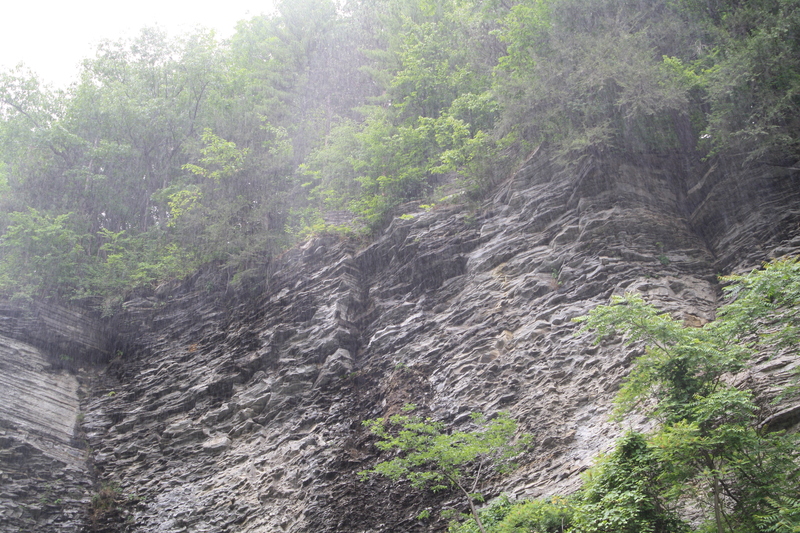 Our timing was perfect – just as we got to the car, the heavens opened up and it POURED!! The Heavens opened as we got into the car! 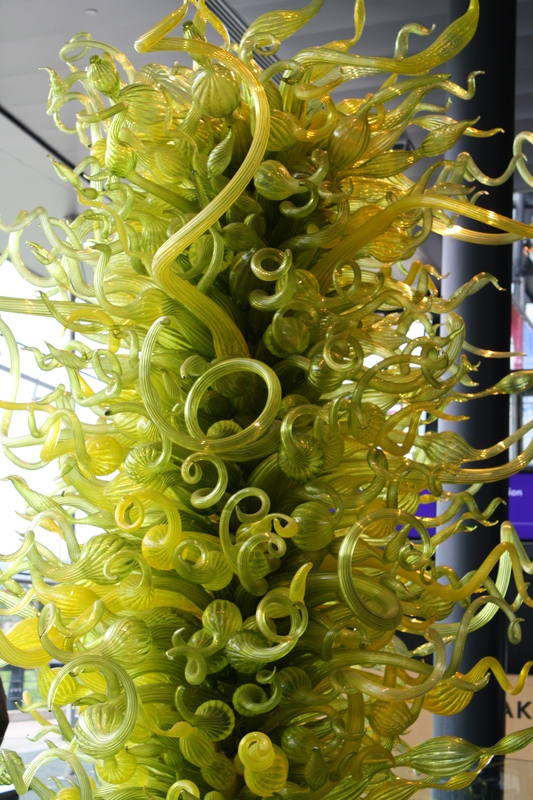 We made the decision to go straight to Corning to visit the Corning Museum of Glass. We were less than ten minutes up the road and the sun came out! It reminded me of Nova Scotian weather! 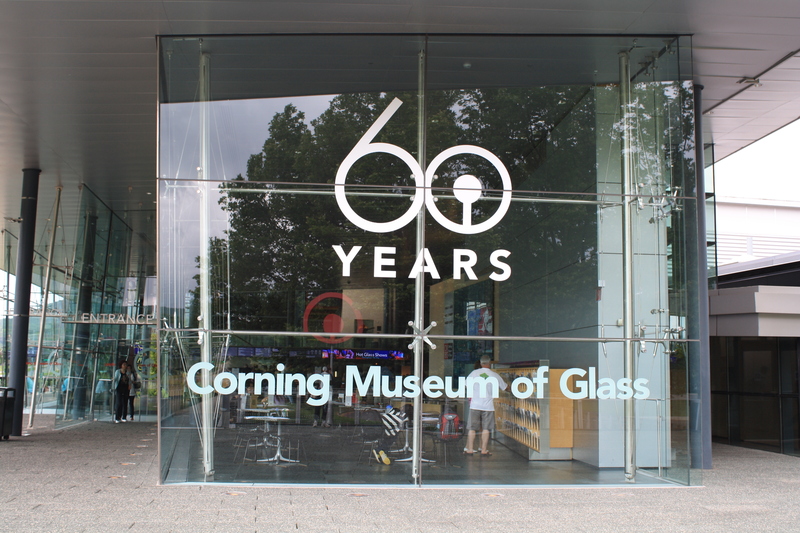 The Corning (As in Corningware casserole dishes) Glass Museum was interesting with beautiful displays of glass throughout the ages. 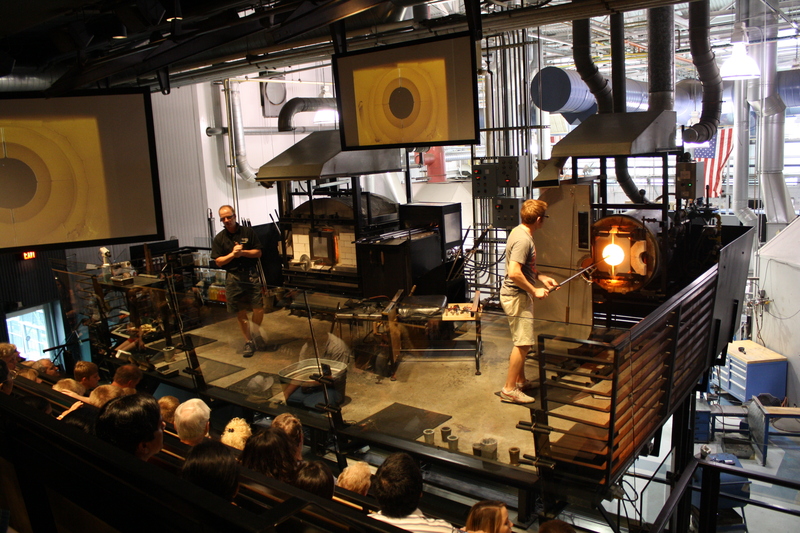 There were also live demonstrations and many tour buses. Kate& I were able to each blow our own glass ornament outside. Because they need time to cool (the kilns are at a temperature of 2100*F! ), they will be shipped to us. Because Canada Post is on strike, they are shipping mine toKate’s house and either she will ship it on to me after the strike, or – even better – bring it with them when they come to Nova Scotia & PEI to go camping this summer!! Kate just had to make the reference "Corning - as in Corningware casserole dishes" and I was in! 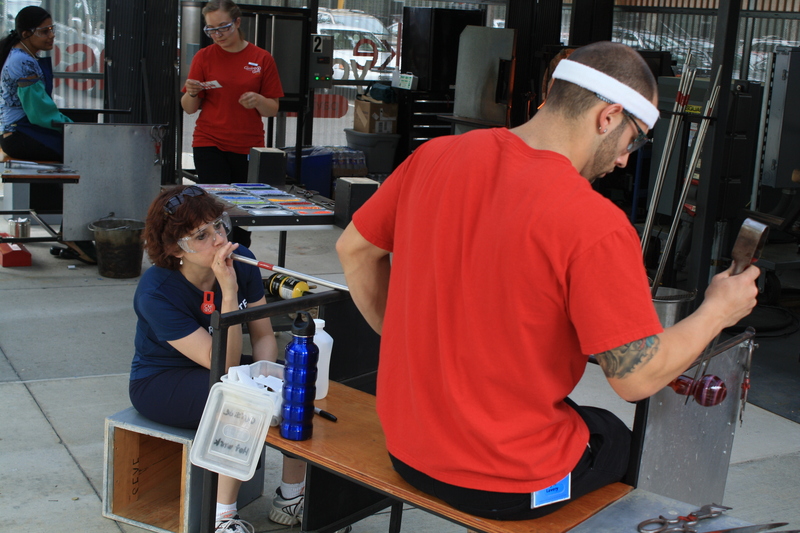 Blowing my own glass ornament! 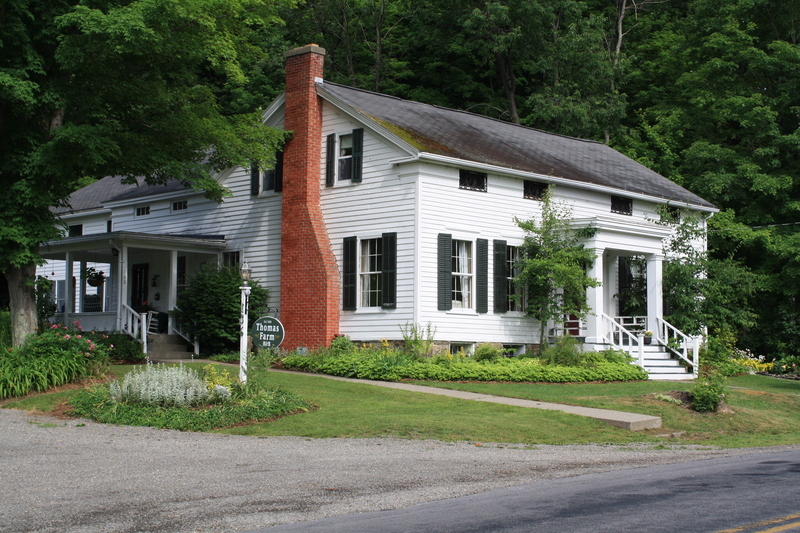 It was late afternoon when we were finished at the museum, so we took the opportunity to get checked into our B&B, “Amazing Grace” at “Five Foxes Farm”. This weekend is graduation, so many B&B’s have been long booked up. We got our things in and then after a quick change headed back into Ithaca. Before we arrived, Kate had booked us massages at Rasa Spa – her treat. (Thank you Kate!!) It was just what we needed after all the traveling yesterday, the hiking and the museum today!! We left the spa and headed to the Moosewood Restaurant for dinner at my request. D’Arcy already had one of the Moosewood cookbooks before we were married and some of my favourite recipes have come from it! The restaurant was a leader in local, sustainable food decades ago and didn’t disappoint! 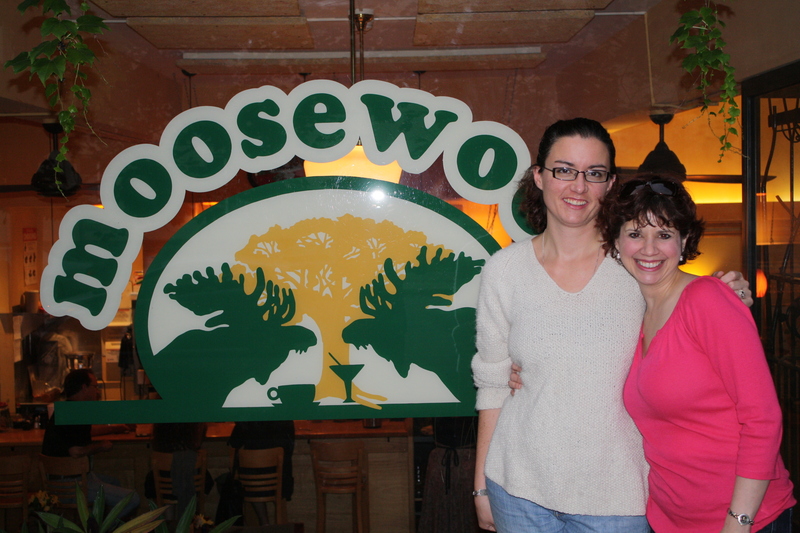 (Kate’s husband commented that he felt it funny that a mainly vegetarian restaurant would be called “Moosewood”!) The servings were plentiful and delicious! I am still feeling stuffed! My only complaint is that the service was perhaps a bit too fast – we had just started our appetizers when our salads arrived. I had just finished my salad and Kate was still working on hers when our entrees arrived! We had quite a table full of food for a while! Don't we look relaxed after our massages?! This meal was fantastic!! After dinner we dragged our exhausted, full bodies back to the B&B for bed. The fireflies are back again tonight, sparkling & lighting up the field across the road. Kate asked if I wanted to go and try to catch some, but I don’t think my tired feet would move fast enough! As we were chatting as we were getting ready for bed, we both agreed today couldn’t have gone much better! 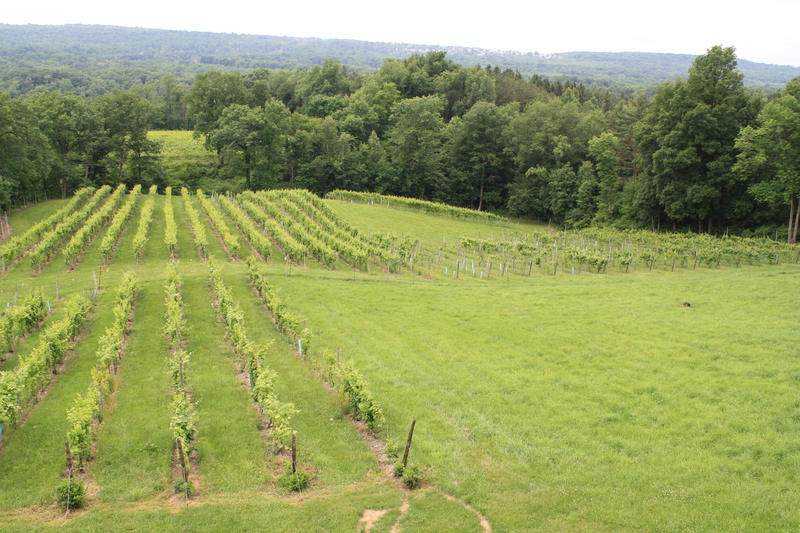 Tomorrow: A winery, some errands, my first Starbucks, a sad goodbye and Cornell! 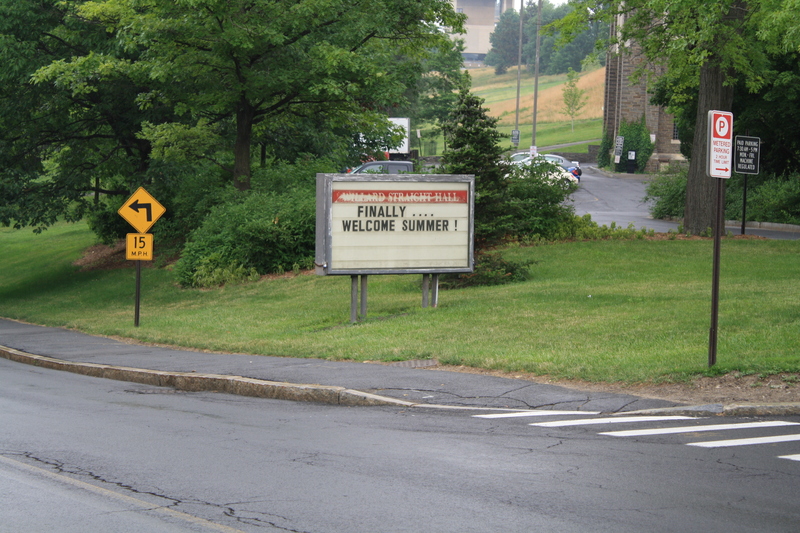 Cornell – here I come! I am officially on an adventure! This winter, I became aware of a professional development opportunity, sponsored through the Tourism Industry Association of Nova Scotia (TIANS) and the Atlantic Canada Opportunities Agency to attend the Professional Development Program at Cornell University. As a university student studying Tourism & Hospitality Management, I used to pour over the journals from the Cornell School of Hotel Management. I doubt I ever passed in a paper without at least one reference to those journals. I knew I had to apply! I was accepted to take the first course towards a Certification in Strategic Hospitality Management. The past few days, I have been scrambling to get ready for the trip. It’s a busy time of year to start with; D’Arcy’s been marking exams and coming up with final assessments, the kids have all had their year end activities and the B&B has been in full swing! D’Arcy was up all night last night so that he could get his marks submitted and bake bread (our end-of-the-year teachers’ gift). When I came downstairs this morning at 5:50, the table was set, the muffins were made and there were eight loaves of bread on the counter and four in the oven! 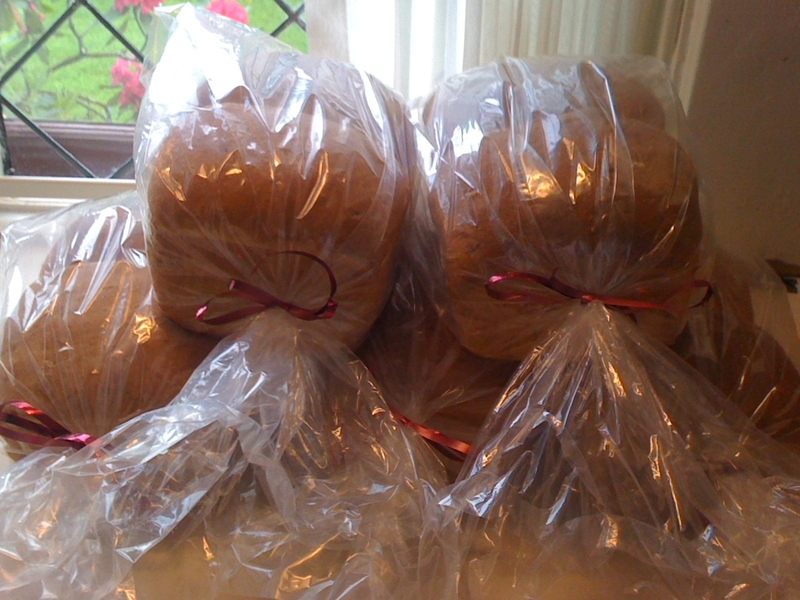 Oatmeal Brown Bread for the teachers! This morning, as I served breakfast, I mentioned to the guests that I was excited because I would be leaving late morning to fly to Ithaca, New York. We had a West Coast crew this morning – British Columbia & Washington State. As president of the school parent-teacher group, as soon as our guests left I scooted out and, with my sister-in-law, took two trays of fruit and six dozen muffins up to the school for the teachers to show our appreciation for all they do. I came back home and helped my father finish the kitchen clean-up. Before we knew it, it was time to hit the road for the airport! I had received an email that my flight was delayed by and hour, but my father was anxious to get me to the airport! (Keep in mind that this is the same man who tried to get me to my wedding a half hour early!) My flight was delayed, so I dropped some of our Belgravia Bed & Breakfast brochures off at the airport Visitor Information Centre. As I was talking with Natalie, we discovered that her cousin is my teaching mentor at the Nova Scotia Community College! It’s a small world! I went upstairs to US departures and breezed through security. I went on to be cleared through US Customs and got pulled aside! At first I thought it was because the purpose of my trip was to study and they thought I needed a certain Visa. I got taken into a secondary area and asked to sit in a sterile environment while I waited for the Customs Agent to look up all the information. It turned out I was screened because the name on my passport is not the name on my birth certificate! I’ve never heard of this! He told me all my information is incorrect and that I can’ t just “change my name”! Talk about stress. Luckily, I had other ID with me and so pulled out my driver’s license and my Nova Scotia health card which have my name on them, exactly as written on my passport. He allowed me to go through but told me when I get my passport renewed, I should get them to change my name. Actually, I will be applying for a NEXUS card instead to be pre-cleared and avoid the opportunity of something like this happening again! Through security but before going through US Customs! I went into the holding area which was really quite lovely. It is bright and airy and clean. I had a burger and watched the planes, then did some homework. Our daughter has a severe Peanut/treenut allergy, so we never eat nuts of any kind when we are around her; since I will be away for a week, I had my first Crispy Crunch chocolate bar in over four years! Yum!! The Halifax Stanfield International Airport has been voted best airport in its class for the past seven years, and after traveling through three airports in one day, I understand why! It was a very pleasant experience. My flight finally took off from Halifax to Philadelphia and I figured that when I landed I would have about 20 minutes to switch terminals and make my connecting flight to Ithaca. As it turned out, I needn’t have worried as when I arrived, I discovered the flight to Ithaca had been delayed by an hour-and-half. My friend Kate, who grew up in Upstate New York, but now lives in Boston, has met me for the weekend, so we spent our time in the airport getting caught up after I called the owner of the B&B where we were booked to let her know what was going on. When we boarded the plane to Ithaca, we were told that due to severe weather earlier in the day, there was a backlog for take-off and we were behind approximately 22 other flights. We ended up sitting on the runway for an 1hour and 45 minutes before take off, so it was close to 9:00 when we finally arrived in Ithaca. Luckily, our bags came right through and the rental car was waiting for us. We drove to Thomas Farm B&B and brought our things in. We have a sweet room with a loft, so freshened up a bit and then headed back into downtown Ithaca to find something to eat. Along the side of the road, Kate pointed out the fireflies – the sky was just full of them and it was just beautiful. We also had a possum run across the road in front of us which was another new experience! 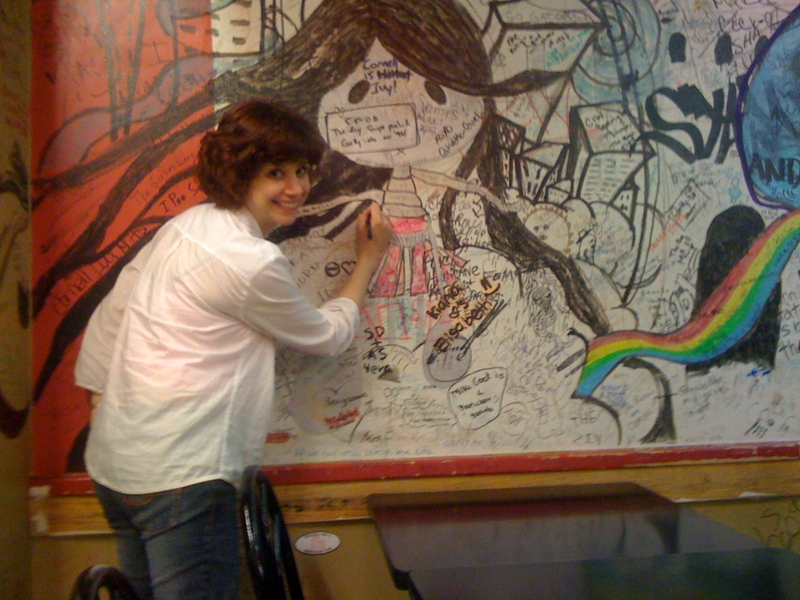 Most of the nicer eating establishments were closed and we decided that we weren’t quite up to going to one of the College pubs, so we went to “Collegetown Pizza” and had a slice of pizza and wrote our names on the wall with many others! We came back to the B&B where we poured over the tourist literature of the Finger Lakes area and made a plan for Saturday before calling it a night. Next up: Exploring the Finger Lake Region of New York State! Tomorrow is a celebration! It’s National Aboriginal Day and we will be going to the Glooscap Heritage Centre to celebrate between 11:30 and 5:00. As I’ve written here before, I was fortunate this year to be the core faculty for the first Aboriginal cohort to graduate from the Nova Scotia Community College (NSCC) with a Diploma. The Tourism Management program is intense, but fun, and I absolutely love my class. 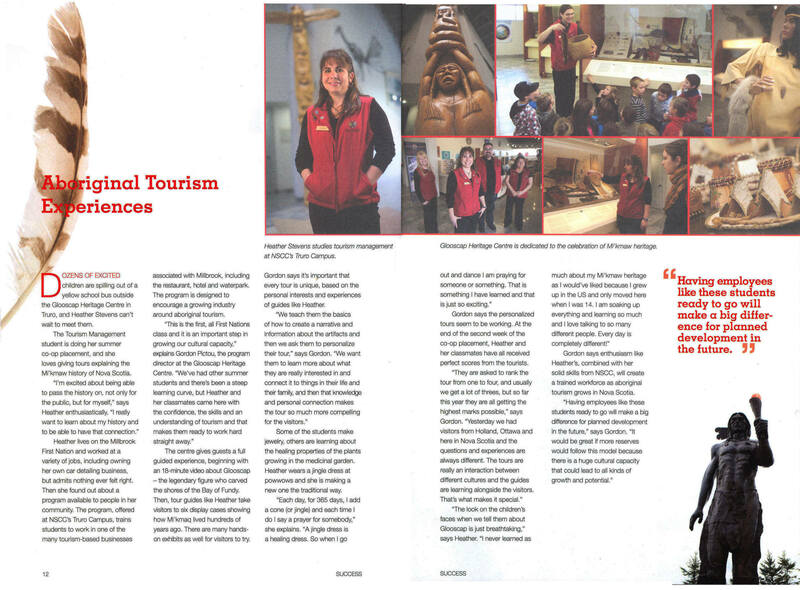 The following article was published in the NSCC Student Success Magazine 2011 and distributed at graduation across the 13 NSCC campuses last week. I am so proud to be part of this project! I can’t wait to see the five students who are fortunate enough to be working at the GHC for their work-terms this summer, and hopefully many more of my students, there to celebrate their Mi’kmaq Culture! I will be sure to post photos and details of the celebration, but if you’re driving along the 102 Highway, please come in and see us – everyone is welcome! *You can click on the image to enlarge and read the article!! 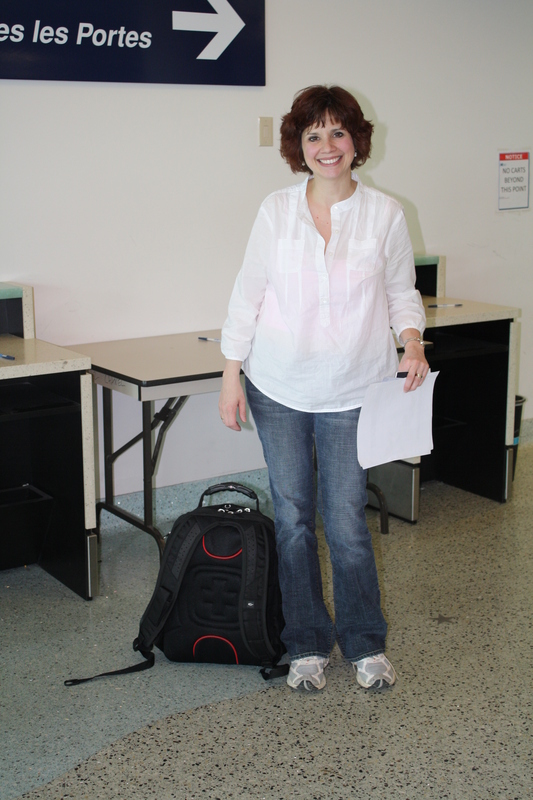 For more information, this article – also featuring Heather, was also featured in today’s Truro Daily News! Each of these events are located about an hour’s drive from The Belgravia. * And just out of interest, the Clarks (Anne’s side of the family) were from Insch, near Aberdeen, in Scotland. TRURO – A number of Colchester County businesses were honoured last night for being the best in their speciality. The second annual Best of Colchester awards were handed out in Truro. Taking home the bed and breakfast award was Belgravia Bed and Breakfast. It was the second consecutive win for the business. The business, in its ninth year, is expecting a healthy tourism season if early-season visitors are an indication. “Tourism looks fantastic. We have a full house and only had one day without anyone and that’s because I was away,” said McDonah, estimating business is up about 20 per cent from last year. Best entertainment venue and festival honours went to the Marigold Cultural Centre for the second time. 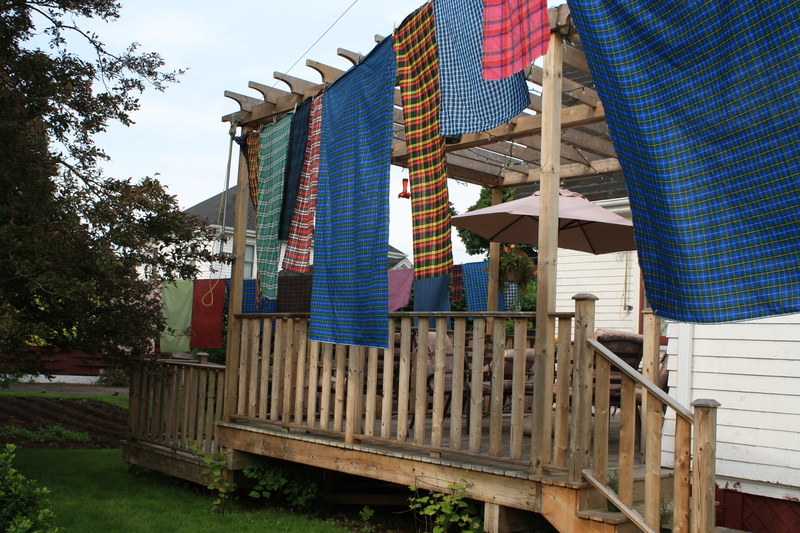 “It means a lot,” said the Marigold’s executive director Donald Ferguson. Ferguson said the Best of Colchester awards are a benefit to all local businesses. Taking home the computer sales/repair award was first-time winner G&G Computers. 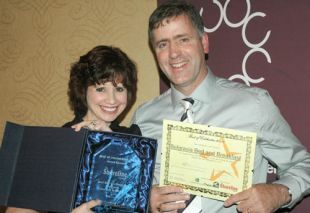 Anna Feltmate, employee, and Cory MacDonald, manager, accepted the award. “It’s amazing,” said Feltmate of the business that was also nominated last year and will celebrate its 10th anniversary in Truro in the fall. “It gives a little boost to the shop and it gives a voice to people” by voting for their favourite businesses, she said. The winners were voted on by the community. There were 2,000 more votes this year compared to last year. Online voting took place for two weeks in May. The three nominees with the most votes in each of the 25 categories became the finalists and all awards were handed out last night at the Best Western Glengarry. 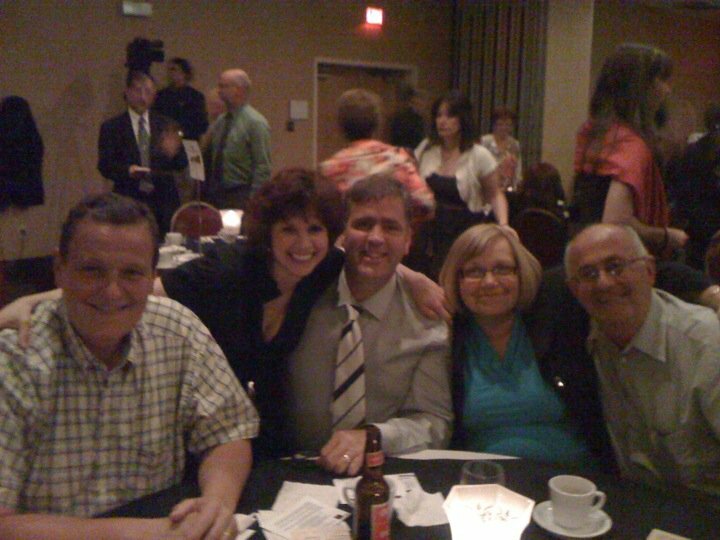 The awards were hosted by the Truro and District Chamber of Commerce. Here are the winners of this year’s Best of Colchester awards. We were thrilled to get to spend the evening with our friends, Ann & Larry MacCormack from Tulips & Thistle Bed & Breakfast and Maarten Schurmans from Baker’s Chest. 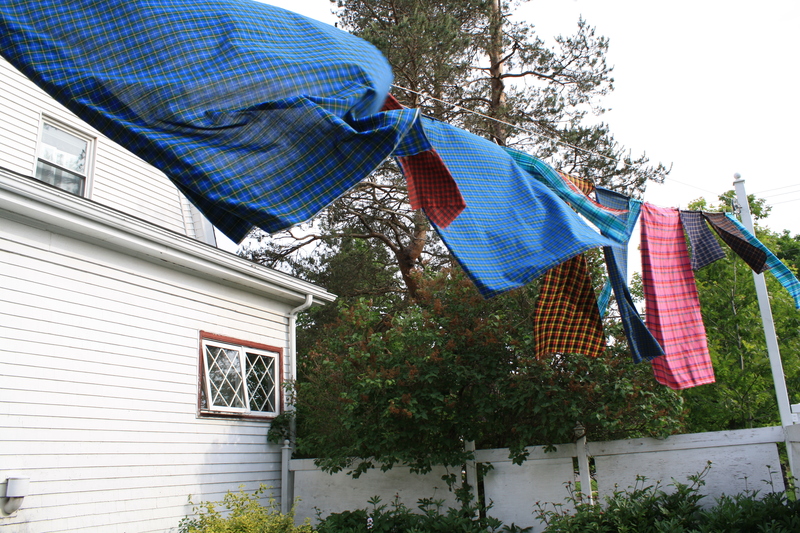 We are fortunate to have B&B’s of such high quality in the Truro area.